To have this kind of design, we will need to use custom classes and grid. 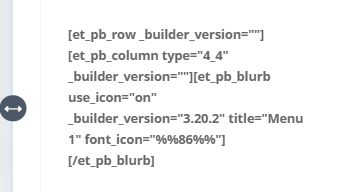 Please declare the grid-image custom class in the menu and add a class in the row called grid-container then duplicate the container two times to have 3 column image. Here’s the quick screen recording. Please go to your WordPress Dashboard > Divi > Theme Options > Custom CSS and add the following: Feel fre to change the font-size according to your liking. If you think the Divi columns features doesn’t support what you want in creating a mansonry grid layout either for your gallery, portfolio, images. This CSS grid will do the trick for you. Basically, we will need to use 1 column and push all the elements vertically or horizontally depending of the design you wanted to create. In this example, we will create this kind of layout. In this guide, Bookworm Head will walk you through the most common troubleshoot you can do to fix the loading issue with Divi. Some of the plugins can trigger the loading issue. Mostly, these are poor plugins that haven’t updated for years or it’s just not compatible with Divi. In this case, try to disable the plugins temporary to isolate what’s causing the issue. If the problem solved after that, then you will need to find which plugin is conflicting, simply enable it one by one. If the problem occurs again when activating a specific plugin, then you need to keep that disable. Also, don’t forget to clear your css file generation. Simply go to WordPress dashboard > Divi> Theme Options > Builder > Advanced > Clear or disable the css file generation. Old version of PHP is unsecured and since Elegant Themes keeps their theme up to date to WordPress best practices, you need to keep your site as well. As an example, I will use Siteground since this is my hosting site. If you still haven’t fixed the error after the above recommended, open your WordPress dashboard in Incognito > right click and inspect the elements, if you found any error in the console then there might be something wrong in the WordPress or Theme installation. If that happens, you will need to reinstall your WordPress or Theme. How to reinstall your Divi website? Make sure you backup your custom CSS and jQuery if you have some. Simply put it on the notepad++ so you can re-add it after reinstallation is finished. How to reinstall the core WordPress files? 1. Go to WordPress.org and download the latest version of Divi. Unzip the file. Warning: Always backup your website when doing the reinstallation. Does the above recommendation fix your current issue? I’ll be happy to know your feedback! In this tutorial, I’m going to reveal how to create an advance and interactive button that you can use for your HubsPot landing page to reduce bounce rate. I will update this blog when I have time! Thank you!